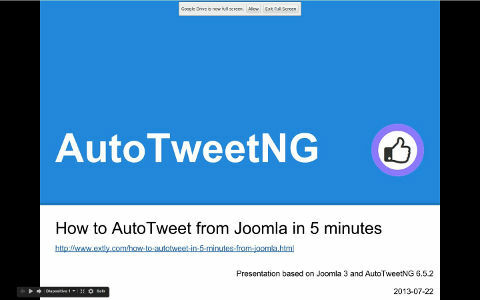 AutoTweetNG Free - Auto Posting from Joomla! 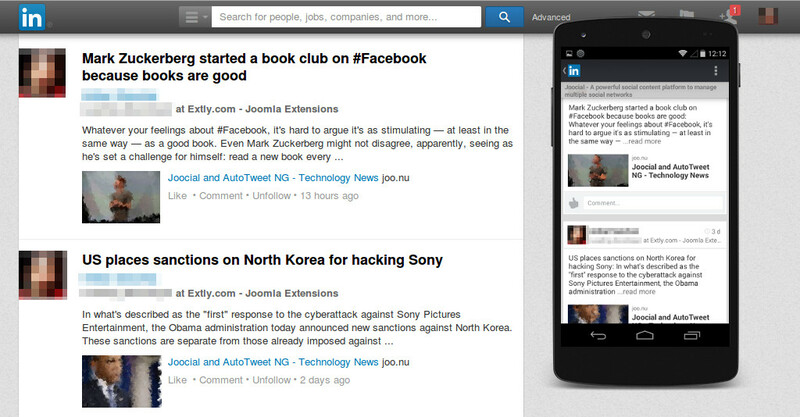 AutoTweet NG Free is a Joomla! extension for automate post publishing to Facebook, Twitter, LinkedIn and more. Simply, AutoTweet automatically posts your content to social networks. AutoTweet NG Free solves social networks integration in Joomla with mimimum effort in an efficient way. For starters, when an author creates a Joomla article (content item), AutoTweet generates a content request and auto-tweets a message to the enabled social networks: Facebook ( API 3.0 requires App Review), LinkedIn, Twitter and more. AutoTweet NG Free has a set of features to simplify social management based on automated auto-posting. What is the main difference between AutoTweetNG and Joocial? AutoTweet is mainly oriented for unassisted auto-posting, you just keep using Joomla as usual, creating articles or other content items. 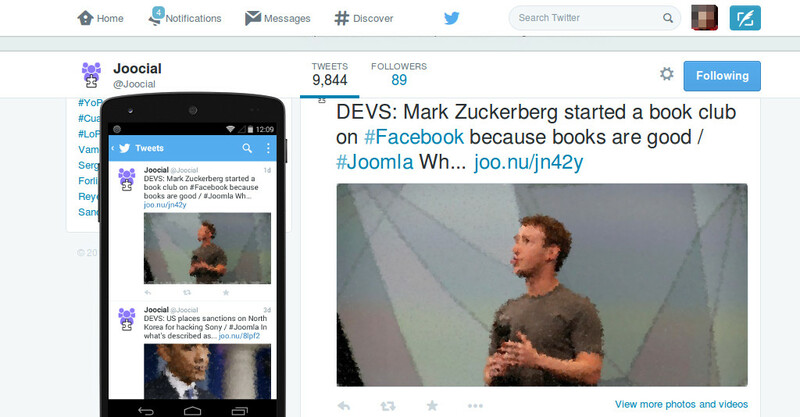 On the other hand, Joocial has all AutoTweet's features plus advanced features for social management. For instance, Joocial has a "publishing agenda" to repeat Posts, or "working hours" to define when your audience is online. In a real life scenario, a publisher can create a new content item and define the social impact, associating media attributes. () API 3.0 requires App Review. AutoTweetNG Free has most back-end features to support automated auto-publishing. However, it has specific restrictions on channels and RSS Feeds. In addition, it does not have the full hub of integrated extensions and extended management features. Channels: limited to 2 channels. You can create up to 2 channels only. RSS Feeds: limited to 2 feeds. You can create up to 2 feeds only. No support for Yourls, Goog.gl, or other shorteners. Only Tinyurl is supported. Only the Content-Extension plugin is available for free (All other plugins are included in the AutoTweetNG Pro or Joocial). A whopping number of 84 user reviews speaks up for AutoTweetNG as the most popular extension for Social Share Auto-Posting for Joomla!. In addition, the total number of user reviews for the whole family (AutoTweet Free, Pro and Joocial) is 149! Very usefull and time saving extension! ... The setup is very easy and guidelines are helpful. Now we can focus on content and the extension is doing the work for sharing recipes on all major social networks :) And that is not all... support is very, very good! Thanks guys. Great extension and very versatile! The following screenshots have been generated from Joocial News demo site, capturing auto-published content in a desktop view and a mobile device view. 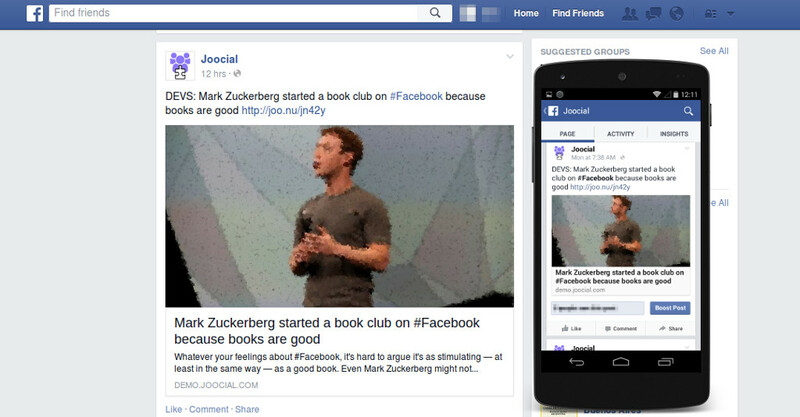 As part of our social media management strategy, we operate the Joocial News demo site. In this way, we have a perfect leading case to show what can be achieved creating a news site based on +20 RSS Feeds to distribute content messages to our social channels. Joocial for Joomla! CMS is a real social media content management. AutoTweet has a poweful editor to create and edit social posts. In this way, you can create new messages to follow the same content defined strategy than the rest of the posts. Web Push - Pushwoosh (only Joocial). Support for images . 4.6 stars - "So far So good"	by Shadow The layout/ userfeel is fantastic so far. It installed easily from the second link. First link got a "cannot find install file" So definitely go for the "install from web link" Free version only gives 2 channels, that's perfect for me, I only use facebook and twitter. However, getting started is not like Klout or any online scheduler. There is no "access Yes" button or checkbox. It takes configuring via developer pages and creating app things. So it's not a "one and done". I am not sure when I will get around to plugging in all the details as I was not in the mood for that today. I really wanted something fast fast fast so I could get to scheduling that takes hours hours hours. But it is easily readable. There are instant help file links to help with the many developer apps I will have to create as soon as I have freetime. 5 stars - "Great extension and very versatile!" by Marc Bressman This extension does what it promises, and more! I'm only using it right now to publish posts from my Joomla site to LinkedIn and Facebook, but I know it can do much more and will probably take advantage of additional features in the near future. It also has a paid version that I might consider trying as well. There were a few questions I had when I first started using it, but the support from the developer has been outstanding!